This Valentine’s Day encourage early literacy and math with Wikki Stix created heart puppets. 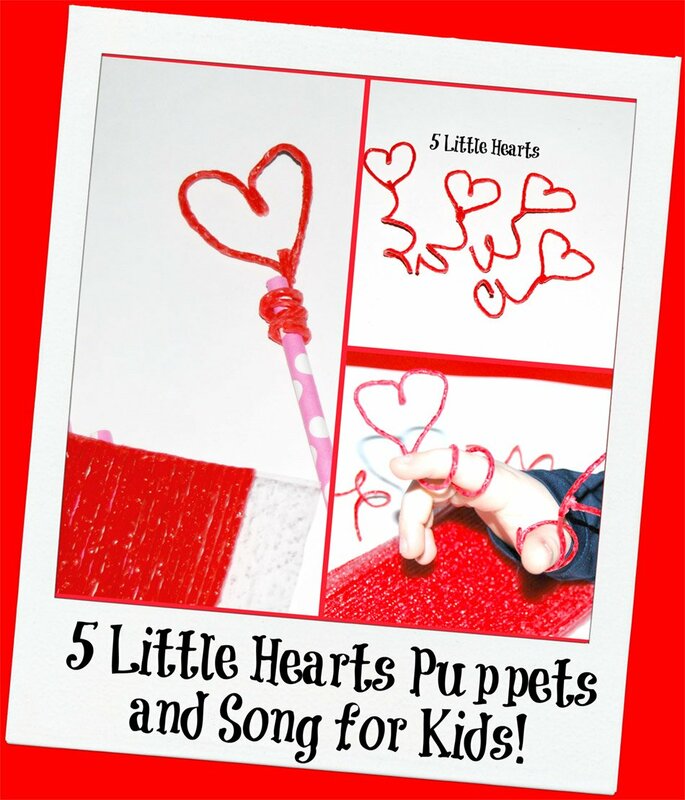 Sing the song, 5 Little Hearts, and invite kids to use their created puppets to play along. The puppets can be used after the holiday has passed to support early language and counting skills as the kids gain confidence and skills! Wikki Stix Heart Puppets for Kids! Set out red Wikki Stix and invite the kids to create 5 heart shapes with the Wikki Stix. For younger kids, show them a picture of a heart or draw a heart on a note card and have the kids trace the heart with Wikki Stix. Set the created hearts aside. To create finger puppets: invite the kids to wrap the red Wikki Stix around a finger and then gently loosen the Wikki Stix to take off. 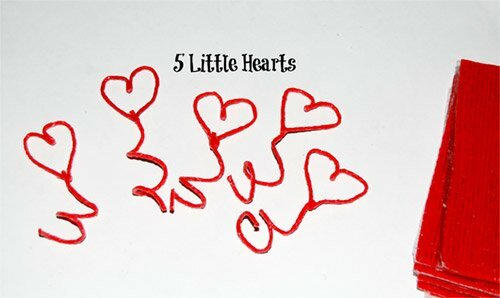 Make 5 Wikki Stix spiraled shapes and attach one of the created hearts to one end of each spiral (see photo – 5 Little Hearts). 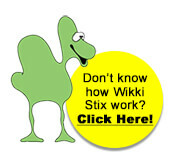 To create stick puppets: invite the kids to wrap the red Wikki Stix around the tops of 5 straws or craft sticks. 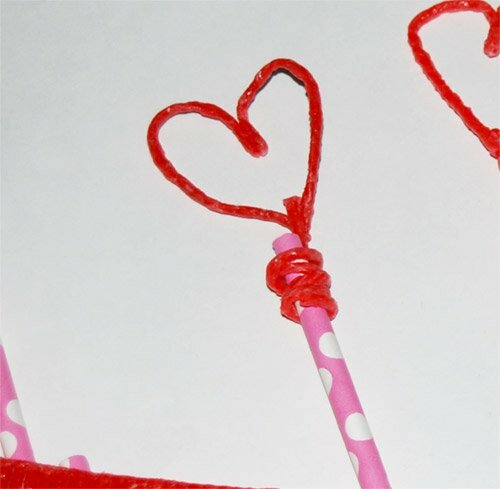 Attach the created Wikki Stix hearts to the Wikki Stix wrapped sticks (see photo). When finished creating the Wikki Stix heart puppets, play the 5 Little Hearts Power Point (download Power Point here) and sing the song (to the tune of “5 Little Ducks”) with the kids. As the kids learn the words, have them hold up 5 of the created heart puppets. When each verse is sung, invite the kids to remove one finger puppet (or put a stick puppet behind the back) to encourage early counting skills. As the kids gain confidence with the song and the puppets, have them put on a puppet show for their peers. Creating the heart puppets, playing with numbers, and singing encourages early math, literacy, and fine motor skills. 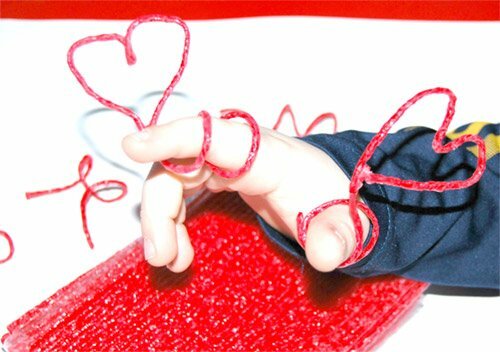 The Wikki Stix heart puppets are FUN to make and can be used to reinforce skills long after Valentine’s Day has come and gone! Valentine’s Day STEM Word Building Challenge for Kids!